If there’s one thing our look into Scandinavian performance car culture over the past month has taught me, it’s to always expect the unexpected. During our summer tour through Sweden and Norway we’ve managed to to check out an amazing variety of machinery from all over the greater Northern European region, many of which quite literally had to be seen to be believed. 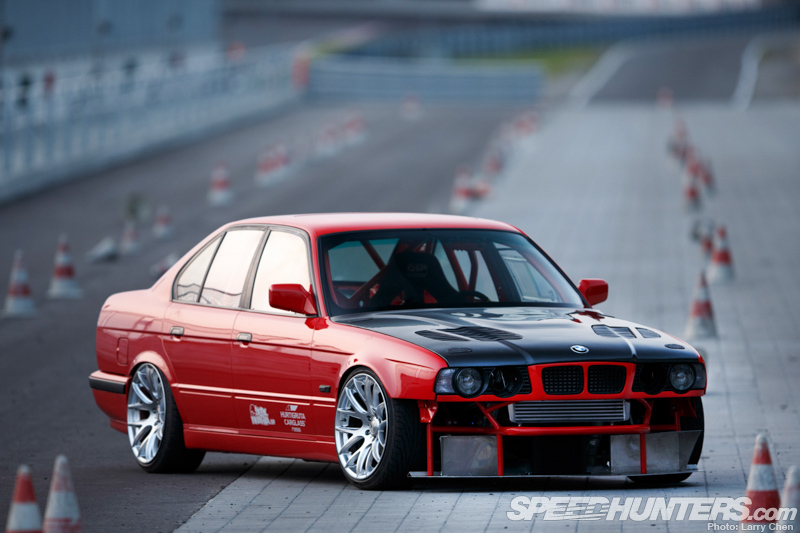 MI Performance’s time attacking BMW 5 Series is one of those cars. 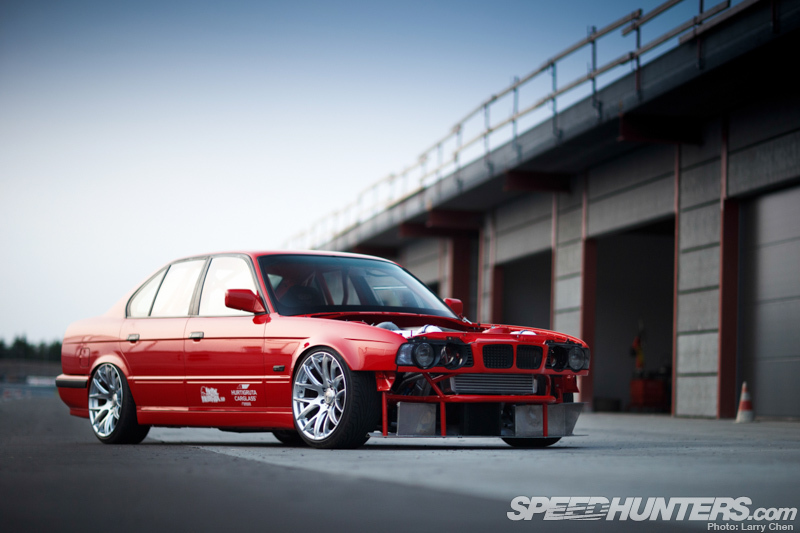 Designed, built, and soon to be driven by MI’s owner Mazhar Iqbal, the angry E34 is yet another result of a long, cold and dark Scandinavian winter spent in the workshop, and some serious car building skills to boot. 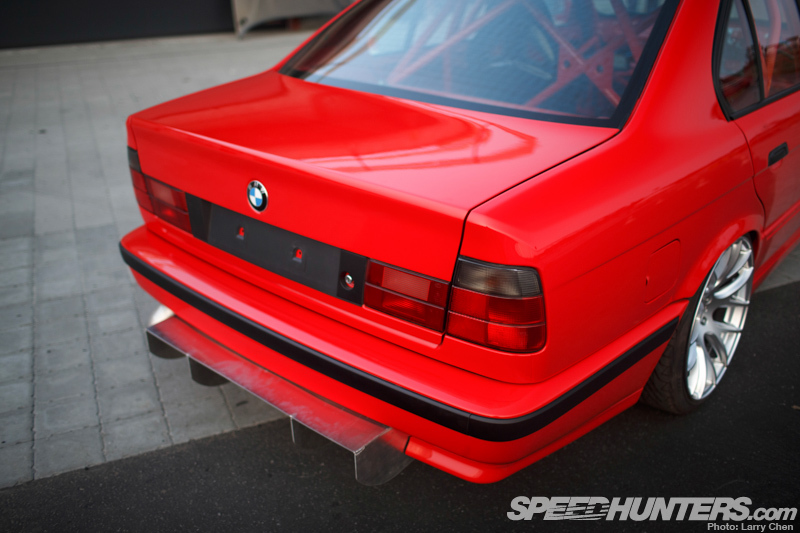 Although the majority of Mazhar’s previous projects had centered around Audis and power sliding, the opportunity to break from the norm and engineer a BMW for grip racing – or more specifically Gatebil’s hotly-contested Extreme Time Attack series – seemed like a pretty good way to highlight his company’s performance and race engineering prowess. The fact that he already had a donor car tucked away in a barn awaiting some sort of modified fate, totally sealed the deal. Although the project wasn’t quite ready to be unleashed at Gatebil Rudskogen earlier in the month, there was no way the crew was going to leave Norway without a closer look. Engineered around a somewhat substantial boost injection, the 3.5L straight-six is an impressive looking creation. 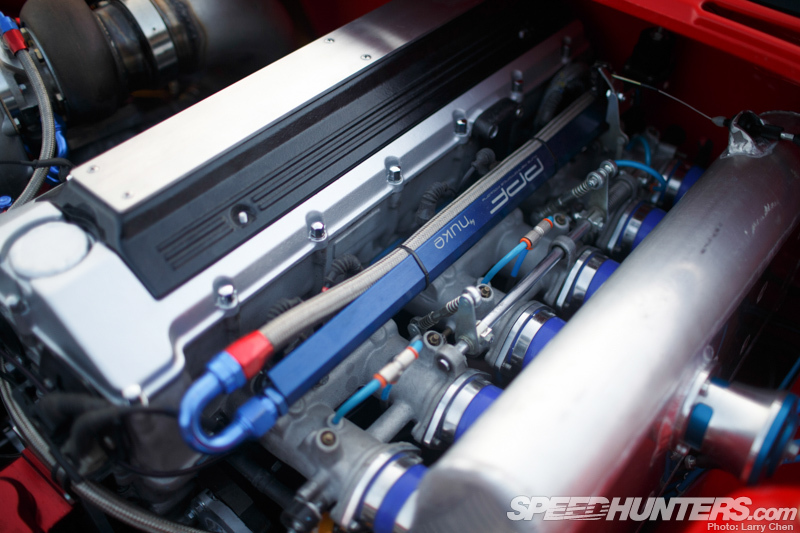 At its core is a modified M30B35 block toughened up with CP forged pistons, Eagle rods and a crankshaft borrowed from an S38 BMW M5 engine. The DOHC cylinder head is S38/M5 hardware too, though now fitted with custom spec camshafts to suit the application. 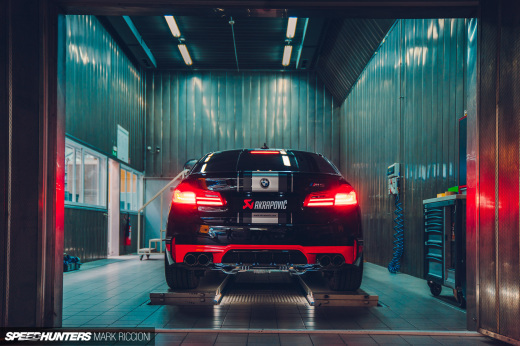 The head upgrade was a bit of a no-brainer for Mazhar, offering superior flow capabilities straight out of the BMW M box while allowing the use of the M5’s individual throttle body fuel injection system, which in this instance is fed from a custom-fabricated oval plenum chamber. 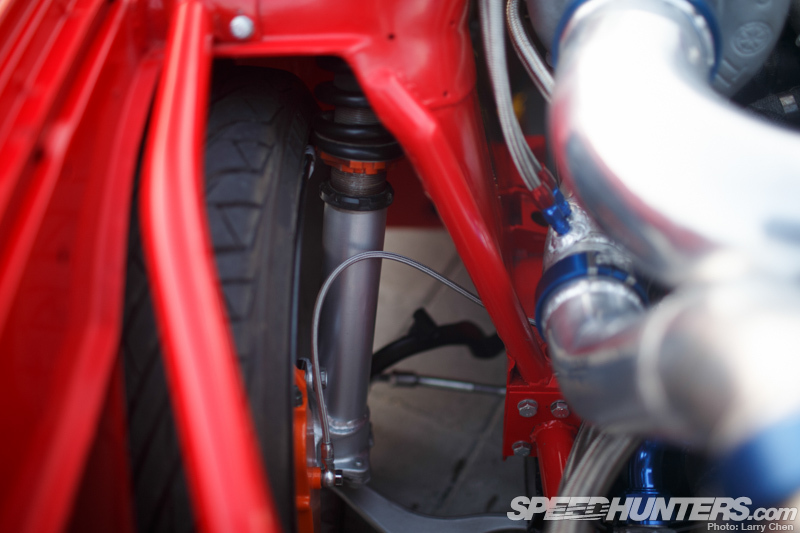 The power-making side of the equation is the Comp Turbo CT43-749 turbocharger that’s high-mounted on a custom tubular exhaust manifold and harnessed through a TiAL external wastegate. Right from the outset four-digit capability was a prerequisite here, and in that respect the Comp turbo is – or should I say ‘was’ – definitely up to task. Even though it’s only been a few short weeks since our shoot at Rudsgoken Motosenter, the CT43 has already been replaced by a Garrett GTX4204R. 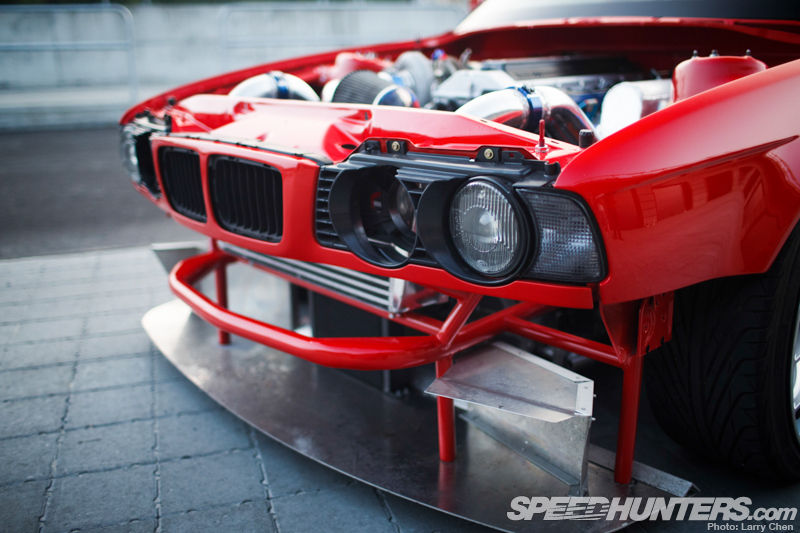 That particular turbo won’t support 1000hp, but it should stretch to 950hp if the need arises. At whatever power level Mazhar settles on, the engine’s ancillary systems should definitely be up to task. 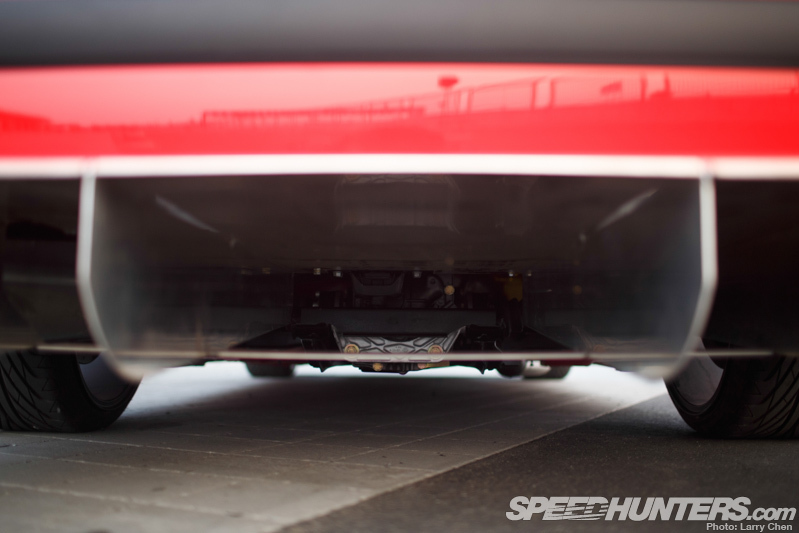 Along with the Peterson tank for the dry sump system and an Optima battery, the trunk features an Aeromotive Stealth fuel cell and a Eliminator fuel pump from the same maker. Through large stainless braided lines and an Aeromotive fuel pressure regulator, the engine’s thirst is satisfied through a PPF/Nuke Performance rail and six Bosch 1600cc injectors. In an effort to improve distribution and overall balance, the engine has been shifted more than a few inches rearward, something achieved through custom mounts and an entirely remodeled firewall. From this angle you can also see the extent of the weight-reducing tube framework that extends ahead of the strut towers, and the custom aluminum front diffuser, which also serves to channel air towards the intercooler, oil cooler and v-mount radiator. The engine bay modifications didn’t leave a lot of space for the six MSD ignition coils, so Mazhar mounted them inside alongside the Autronic SM4 engine management system that gives the firing orders. At first glance you’d probably think that extra long leads would be required in this scenario, but in reality the rear of the engine is underneath the top of the original bulkhead just centimeters away. Like the engine, the driveline has been completely overhauled using a combination of aftermarket performance and OEM parts from different branches of the BMW family tree. The latter extends to the ZF GS6-53 six-speed gearbox which you’d normally find behind a manual 535D, and the entire LSD-equipped rear end which has been borrowed from an M5. The term bulletproof springs to mind. 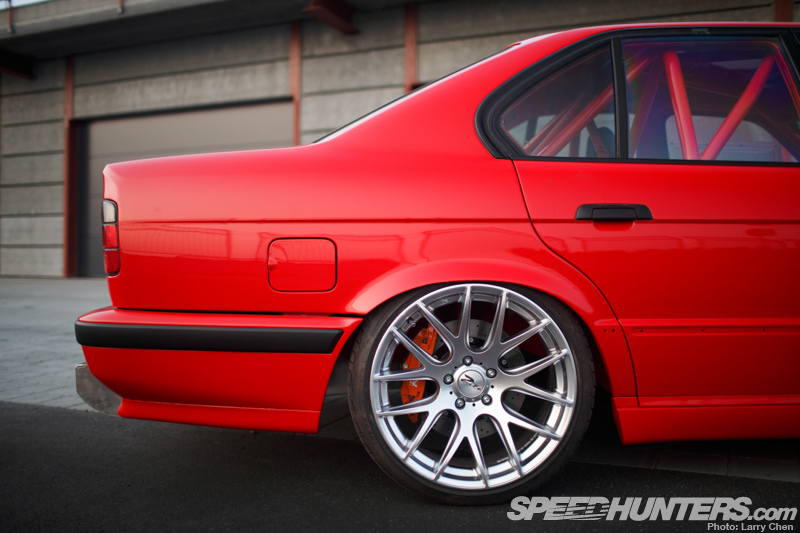 The E34’s purposeful stance comes courtesy of K-Sport coilovers which are used at all four corners; just one facet of a race-ready suspension upgrade that extends to adjustable arms, uprated bars and performance polyurethane bushings. 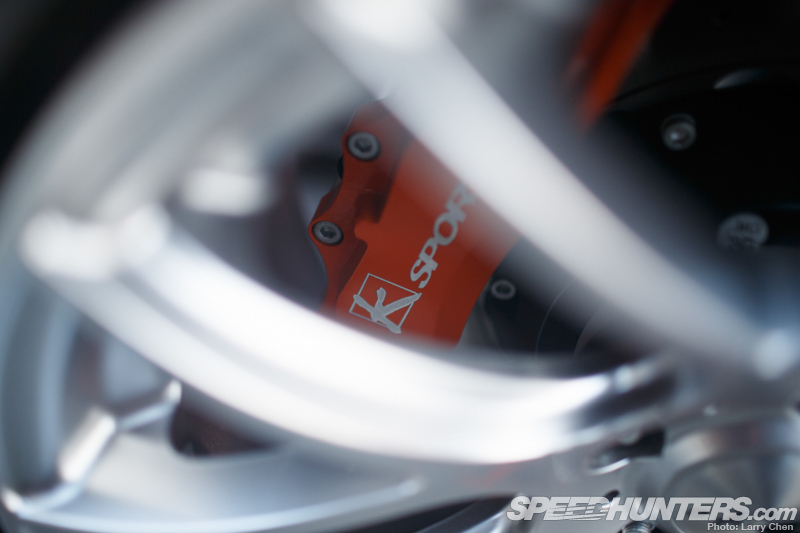 K-Sport components are used throughout the brake system too, with eight-pot callipers on 356mm rotors at the front end, and six-pot callipers on 330mm rotors at the rear. 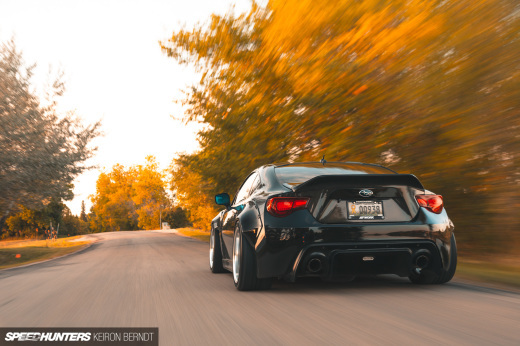 Right now the E34 rolls on Zito ZL111 alloys and street rubber that stands little chance of containing even half the power the engine is able to muster. No surprise then that Mazhar intends to switch them for lightweight race wheels and sticky semi-slicks when the car eventually makes its track debut. When that day finally comes, he’ll be in control from a work space as clean as race car interiors come. 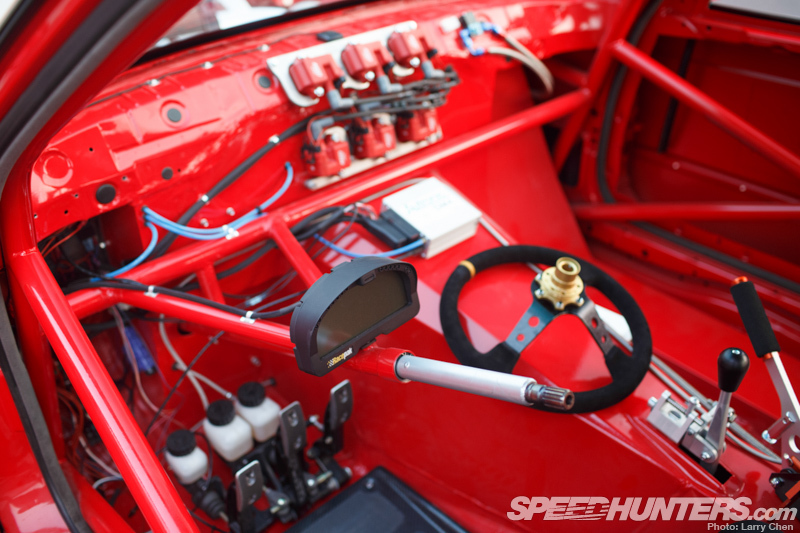 Using a Racepak IQ3 digital display/data logger meant that Mazhar could do away with the dashboard entirely, not that it would likely fit back into its original position anyway given the addition of the roll cage and the new transmission tunnel. For an interior space that’s been stripped back to its bare essentials, there are many details to take in, like the weight saving measures made to the doors, and the complexity of custom metal work around the floor pan. From this view you can see just how far back Mazhar will be seated in his QSP Raceware bucket. As it stands the build is around 95 percent complete, with the small remainder of jobs left to be finished tackled over winter. 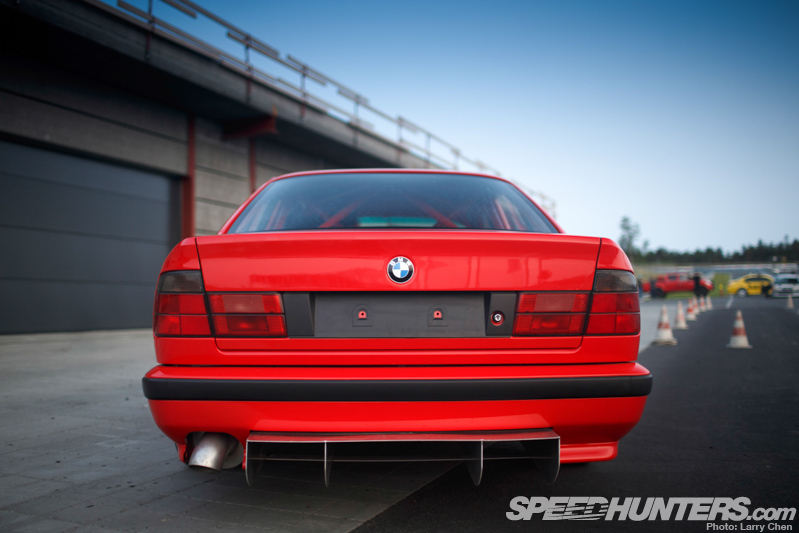 All going to plan, MI Performance will be shaking down the E34 on track May next year at Gatebil Våler, which will leave Mazhar a couple of months to have it all dialed in and ready for the big Gatebil Rudsgoken event in July. 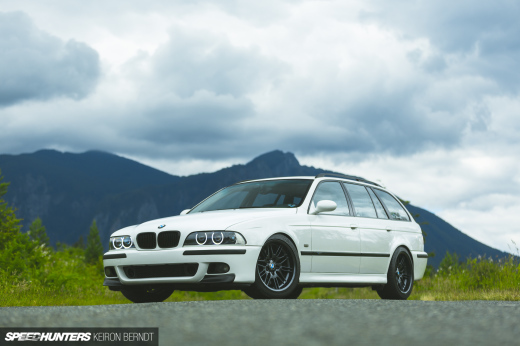 As unconventional as a 5 Series BMW might seem for time attack, the thinking behind this car, coupled with its spectacular build quality, raises little doubts about its hot-lapping potential. In fact, once the full might of its big-boosting 3.5L straight six is realized and Mazhar’s gets a handle on driving, I’m quite sure he’ll have an absolute monster on his hands. But that’s the Scandinavian way. 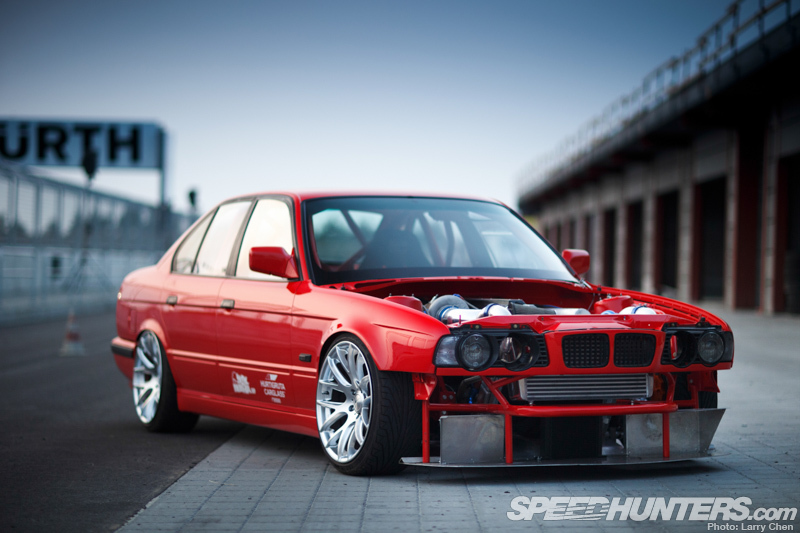 That car one word want !!!! how did you installed the sm4 ?